Unique, whimsical Easter wreath features sunflowers, orange/red tulips, ficus leaves, white mini flowers, black and white eggs, polka dot swirls, greenery, coordinating wired ribbons, and finished with a large decorated wood egg. Measures 30" tall, 26" wide, 8" in depth. ONE OF A KIND! Ships next business day. You will love decorating your door each spring with this beautiful traditional Easter Bunny Swag. Lovely pastel shades of your favorite Easter flowers in yellow daffodils, white Easter lilies, pink peonies, lavender berries, light blue mini flowers, soft green berries, speckled Easter eggs, and lambs ear greenery fill this swag nestled on a burlap and mesh base. Finished with Mr. Easter Bunny holding a 'Happy Easter' sign. Measures 40"tall. 21"wide, 8"deep. ONE OF A KIND! Ships next business day. This elegant Spring/Easter wreath features a beautiful rabbit sign, cream peonies, purple tulips, lavender roses, green berries, white lilacs, ficus leaves, mini flowers, larkspur, and wired floral and gingham ribbons. A lovely way to brighten your door all spring long!! ONE OF A KIND. Ships next business day! Measures 36" tall, 24" wide, and 6" in depth. Deluxe French Country Spring/Easter wreath features lush coral peonies, red hydrangea, cream peonies, pink mini flowers, ficus leaves, berries, wired ribbons, adorable French Country metal sign, and more! Measures 23" wide, 36" tall, and 6" in depth. ONE OF A KIND!! Ships next business day!! Exquisite French Country wreath for Spring and Easter! This wispy wreath features light teal peonies, pink tulips, cream peonies, red mini flowers, berries, grasses, ficus leaves, white apple blossom flowers, burlap and floral print wired bow, and offset by an adorable French Country bunny sign, all situated on a grapevine wreath base. Measures a 30" in diameter, 7" in depth. Young and old will love this adorable chick Easter wreath!! Overflowing with a metal bunny and chick sign, fuzzy yellow chicks, crystaled eggs, tulips, berries, mini flowers, greenery, wired plaid and duponi ribbons, and more!! Measures a full 27" in diameter, 9" in depth. One of a Kind!! Ships next business day!! Cannot be duplicated. 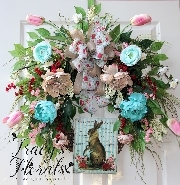 ​An adorable Country/Primitive 'Easter Blessing' church sign is the forcal point of this wreath. Highlighted by cream peonies, light teal hydrangea, dark coral/red ranunculus, cream dalia, berries, ficus leaves, grasses and more. Finished with a light teal and traditional burlap wired bow. Measures 30" tall, 22" wide, 7" in depth with some grasses extending out a bit further. Lovely, classic Easter wreath featuring cream hydrangea, purple tulips, berries, grasses, ficus leaves, purple daisies, mini flowers, burlap/polka dot bows, and more! Beautiful 'Easter Greetings' glittered sign in the center. Measures a full 28" in diameter, 6" in depth. Limitied Quantities!! Say Happy Easter with this cheerful wreath. Peach roses, green daisies, apple blossom, ficus leaves, grasses, blue mini daisies, robins eggs, burlap and spring check bow, and more fill the left side, while a sweet wood bunny and Happy Easter sign complete the right side. Measures a full 32" tall, 22"wide, 7" in depth. Click on images for larger, detailed view. Avg. ship time: One to three weeks. Unique Bunny Burlap Sack Door Hanger features spring green hydrangea, ficus leaves, adorable sisal bunny head, two burlap orange carrots, speckled eggs, grasses. cream larkspur, cream and light yellow mini flowers, all nestled in a burlap sack and tied with a country green bow. Will make an impressive statement on your front door or indoors this spring. Click on images for larger, detailed view. Measures a full 33" tall, 21" wide with some sprigs extending out further, 8" in depth. Avg. ship time: One to three weeks.